My mother always told me that if the meat is high enough in quality and properly cooked, there’s no need for a sauce. I always suspected she said that because she hated making sauces. But mom was not all wrong. It’s a lesson that Jones Brothers BBQ (6911 Imperial Ave. in Jamacha Lomita) ought to learn. Jones Brothers figured to be just the sort of place I would love: a family-run neighborhood joint serving the unique regional dishes they grew up eating. It bills itself as “Mississippi BBQ.” I knew, of course, of the Memphis, Kansas City and various Texas and Carolina versions of barbecue. I’ve tasted them and understand what they entail. But “Mississippi BBQ”? I’d never heard of it and never tasted it. I was, though, very much looking forward to doing so. Unfortunately, based on the evidence gathered during two separate trips to Jones Brothers, the Mississippi variety is overly smoked meat drowned in sauce that’s a bit less sweet and a bit more vinegary than the more familiar Kansas City style. To be clear, the sauces (spicy, non-spicy and a “twist” that’s the other two combined) are good—quite good, actually. The (slightly) spicier version is particularly enjoyable, with an excellent balance of sweetness, acid and a hint of heat that’s not overpowering. But there’s nothing—neither bacon, butter nor any sauce known to man—that can make up for improperly cooked meat. And, sadly, Jones Brothers’ meat was not properly cooked. The pork I tried—ribs, rib tips and pulled pork—was, plain and simple, overly smoked. I own a smoker. I use it often. I love the taste of smoke. But I don’t love the taste of smoke when it’s so pervasive that I can no longer locate the natural flavors of the meat. And, unfortunately, that was the case here. There was nothing subtle about the use of smoke. And the cooking on the ribs seemed uneven from trip to trip, one time falling off the bone, the next not (at least it wasn’t tough). The beef brisket, like the pork, was overly smoked and it came chopped, rather than sliced or pulled. 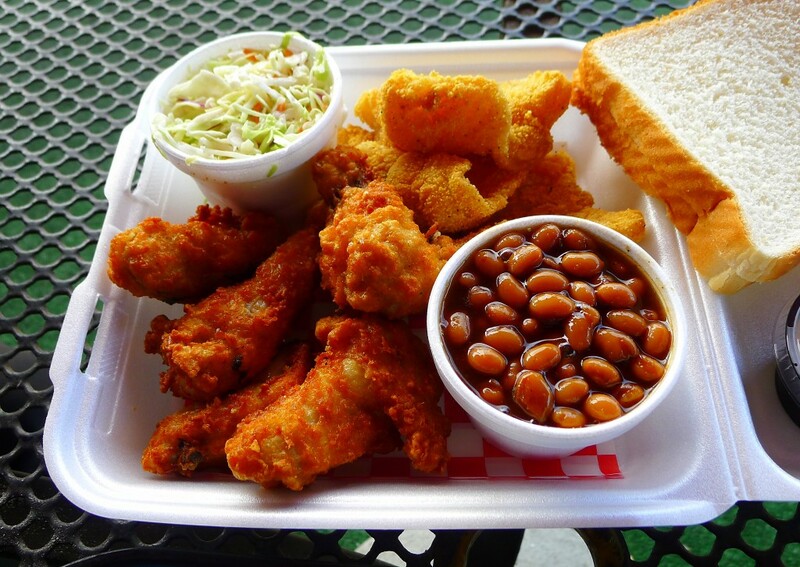 A far better option at Jones Brothers is the fried catfish. It came crisp on the outside, moist and even sweet on the inside. A bit of tartar sauce and I remembered just how good catfish can be. Jones Brothers’ fried-chicken drumettes were nearly as good. The sides are nice, too: The beans are sweet and tasty, the slaw only a bit less so. The collard greens, though, are at another and higher level altogether, deeply savory with an intense hit of broth. The pot liquor takes it over the top. The problem, of course, is that Jones Brothers primarily (though not entirely) identifies itself as a barbecue joint. Unfortunately, on my visits, barbecue is not something that it does particularly well. But if you stick to the broader Southern / soul-food-style offerings, Jones Brothers is a very enjoyable meal. If, however, barbecue is what you want, perhaps you had best listen to my mother a little bit better than I did.